a good life. : Giveaway: it's a pillow, it's a pet... it's a Pillow Pet! Giveaway: it's a pillow, it's a pet... it's a Pillow Pet! when i heard i was gonna get to do a Pillow Pet review/giveaway, i was stoked. why? because i thought they were so freaking cute & i couldn't wait to have one. yes, i repeat... i couldn't wait to have one. i mean, parker isn't even six months old, how much was he gonna care about this thing? i was wrong. p-ray l-o-v-e-s his Pillow Pet. 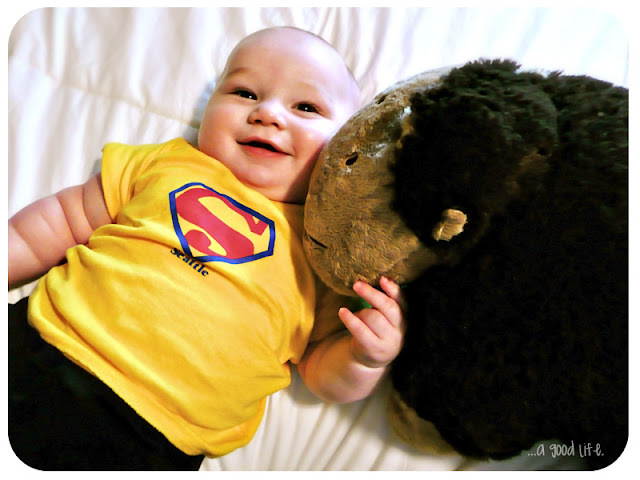 the day it arrived, i set parker down on my bed to play with the "silly monkey" & he was totally giggly & giddy over him. he was grabbing the ears, sucking on the nose, & absolutely loving on him. and i already knew i was gonna love it... i've always been a sucker for cute stuffed animals. better yet, ones you can snuggle with, sleep with, & use as a pillow. but the thing i was totally surprised about was how SOFT it is! you guys, it is suuuper soft. wasn't expecting that. they have 17 different animals you can choose from, so picking out which one we wanted was tough because they are all so cute. and because after watching the website's infomercial, i got a freak urge to buy a snuggie to go along with it. don't worry, i resisted that urge. we went with "silly monkey" to go with our nursery's zoo animal theme, but the decision wasn't easy. i totally wanted the frog, the cow, the turtle, & the puppy as well. er, i mean parker did. and guess what? Pillow Pets is giving away a free pet to one of my readers! yay! --> visit the Pillow Pets website at www.getpillowpets.com & leave a comment on my blog telling me which Pillow Pet is your favorite. so yeah, lots of options for lots of entries. giveaway ends wednesday october 20 at noon & the winner will be announced that night. winner will be chosen at random using random.org. good luck. you will l-o-v-e your Pillow Pet! don't forget to vote. it's good for an entry! I like the monkey too! So cute! My little girl wants the ladybug! Awesome! I love these pillow and I don't even have kiddos yet, but I can save it for them or give it away. So I would want the silly monkey, but seems to be sold out, so my next choice would be the panda. I "like" on fb! and I left a comment as well. I voted for ya on top baby blogs!!! I think you have a super cute blog and always fun to see what is going on in the life of AMY and SAM and now P-Ray!!! I voted, i follow you publicly, and I'll do the others later today. I really want one! I went to the website. They are all so cute! It was hard to pick just one but I think I'll go with the comfy panda! Hi Amy, Brent and I have been following for awhile, love the blog! So I thought i'd finally enter a contest :) I think the puppy and the frog are pretty cute. I really wish they had a duck to go with our nursery, but they are all super cute! Also, now following you on Twitter, voted for top baby blog (again) and publicly following you from our blog on google. :)3 extra votes today, woo hoo! Ok. I blogged about the giveaway, I follow you on twitter, I tweeted about the giveaway, I voted, I follow you, and I visited the site and like the panda! Wow that's a lot of stuff! Oh and I "liked" on facebook! Does it count as 2 votes if I vote on edge and then again on a wi-fi and then again on different wi-fi? If so I voted 3 times today! I love the hungry hippo one! Omg, the hippo would be perfect for Brayden's room! I like the wiggly pig. Also, you are my new twitter friend, which basically means that you now have a new way to read things my students say. We had a lovely conversation about all white people looking the same. I also tweeted about your contest, but I'm not sure if I tagged you. I follow you and I vote on TBB twice everyday except the weekends, then it's only once. You're lucky I'm a little OCD and have integrated voting for you into my schedule. If I don't vote something terrible might happen. Oh, and I blogged about this. I would like my kiddo to get the dolphin. I like Pillow Pets on facebook and left a comment. Fun giveaway! We already have the ladybug and the dog, so we choose the frog! It's a tie between the bunny and the pig. Followed you on Twitter! I never use Twitter but I have an account and I followed you! Followed you AGAIN on Twitter using my cabin's account! OMG my oldest daughter (10) has been begging me about these pillow pets. She loooves the hippo and lady bug. I haven't seen them in stores so I can't judge if they're comfy and whatnot but she's been begging me for one of these. I voted for you today on TMB. I really love the Bumble Bee. Decided we would love the frog over the puppy. :) Voted again this morning on TBB! I always LOVE a good giveaway! Brendan liked the Squeaky Dolphin! Hey voted for you and you are at 42 right now! Whoohoo! Voted for you in the top baby blogs! My favorite pillow pet was the Frog! Totally adorable! I love the ladybug and bumble bee! I voted last night and I voted today! We are so gonna get your blog back to the top! I love reading it! I went to bed so early last night that I didn't see your facebook post about your moms blog until this morning. I was 3 followers away from winning! I was a little sad but I decided to follow anyways. i like PP on facebook as Emily E and told them you sent me! Voted! Twice! By the way I loved the pictures today! Way cute. It's so cool to see you on the first page of TBB. I voted again today. The cow would be perfect ! :( One less vote for my blog... oh well, haha! ... and now following your blog. Two votes today! One at work and one at home! The ladybug is my daughter's fav. I follow *and happen to be quite fond of* your blog. So hard to choose....I'll pick the monkey or maybe the dog. i just love these pillow pets! there so cute. I voted twice yesterday and twice today! Dangit. I have not been diligent about reporting my votes. But I vote every day for you on Top Baby Blogs cause I see your Facebook posts telling me to vote. So here's at least one entry... plus we can pretend I entered every day since the first day of the PP giveaway.